Exalting sterling textures, Desi Antari transforms silver into pennywort leaves. The petite button earrings are beautifully crafted by hand. 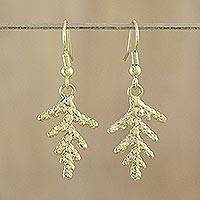 Carol Noriega's earrings evoke jungle leaves that dance in the breeze. Crafted by hand, the modern design features amethyst globes like raindrops. Carol Noriega's earrings evoke moonlight reflected endlessly in textured silver disks. Crafted by hand, these beautiful dangle earrings feature sleek globes of amethyst. 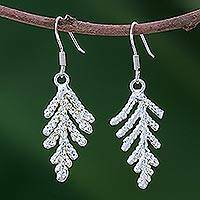 Frozen in sterling silver, acacia leaves glisten with admirable elegance. Maria Belen Nilson designs earrings that celebrate nature's bounty. 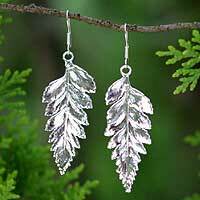 Carol Noriega's earrings evoke jungle leaves that dance in the breeze. Crafted by hand, the modern design features rose quartz globes like sweet berries.